Let me start off by saying that I’m the whipped cream and strawberries type of girl. Since being on this healthy eating journey and learning that dairy just doesn’t agree with me. I tried my best to look for alternatives. I don’t live close to whole foods which typically carries the dairy free option. Plus, I’m more of on the whim type of person and I typically have at least one can of coconut cream in the fridge for those on the whim recipe moments. I purchased two big tubs of Nutella from Costco. They’re not vegan and I try my best to avoid dairy products. I will say that I tried this recipe and I honestly wanted to eat the entire bowl. Yes, it was that good. The Whipped cream added the perfect touch to my vegan crepes topped with strawberries and I was in business. I didn’t share this with my family. However, I will try to remember to get their review. I love that this recipe can be made at home and store in the fridge for up to a week. I also love how fluffy the consistency of this whipped coconut cream is. If you store it the fridge and it loses its shape you just have to whip it up again and enjoy! Open can of coconut milk, taking care not to shake it. Beat coconut cream using an electric mixer with chilled beaters on medium speed; turn to high speed. I love coconut milk, especially in curry soups. Never thought to use it as a cream for crepes though, sounds like a great idea. I've never thought of trying it this way but it looks like the traditional one!! 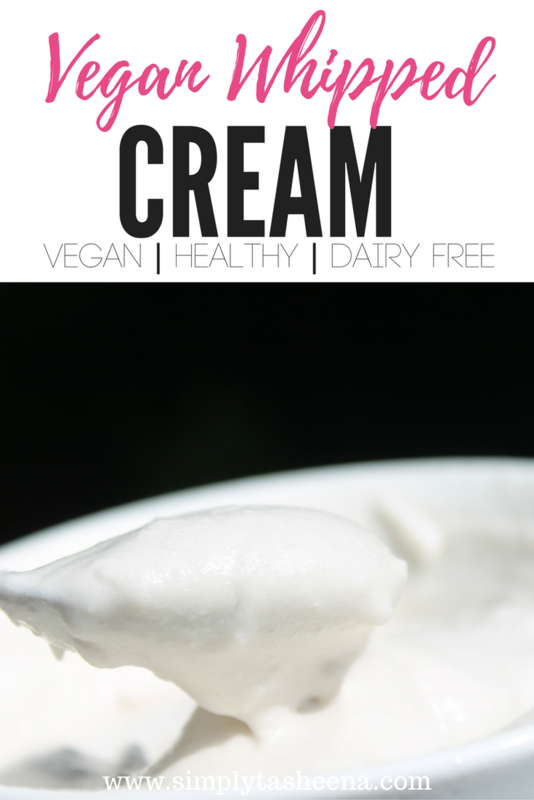 This sounds like such a great alternative to traditional whipped cream! I love using coconut milk as well so I'll have to give this a try. oooohhhhh my gosh. I went vegan a while ago and never even thought about whipped cream! You've just made my hot chocolate game so much stronger! My step-daughter just discovered she has a dairy sensitivity. I will share this with her. Wow this is really a good idea of having a vegan whip cream, I never thought this existed. is there any difference on the taste? This looks so tasty and I love that it's dairy free! I'm definitely pinning and making it next week! WOW, it looks absolutely amazing and so delicious! I would never of thought of trying this! Looks great! I never considered using anything other than heavy cream. Thanks for letting me know there are other options. This is awesome! I am not vegan but I love having more vegan options for my friends who are. I like coconut. And this alternative tradition whipped cream looks so awesome. Will definitely try this. I am a huge coconut fan and my son is dairy free so I WILL be trying this recipe. Thanks for sharing.